I don’t know exactly how this will end for Herman Cain but it probably won’t matter because all is still going according to plan. If the plan is, as many in the political punditry class suspect, that what Mr. Cain wanted all along just in case he didn’t actually become President, was to get some limelight, quadruple his speaking fees and land a sweet gig on a cable news network. Highly likely, so the theory goes, Cain was as surprised as anyone to find himself the improbable frontrunner for his party’s presidential nomination. More than once in the case of Herman Cain I’ve heard the old line over the past few weeks from political insiders about “the dog catching the car.” Now what’s he do with it? Except he’s caught more than a car. Now he’s caught a full-fledged tiger. The sexual harassment claims are not a “he said-she said situation.” They are turning more into a “he said-she said, she said, she said and she said situation.” If there really is a news conference coming in the next few days with two or three of Herman Cain’s accusers talking before the microphones and telling their stories, I would think it entirely possible he may get a visit from some Republican dignitaries in short order. For the good of the party, Herman, this has become too much of a distraction, they will say. Every minute spent talking about your past is once less minute talking about an economy in the kind of shape no incumbent President has ever survived in American history. And Herman Cain can maintain his innocence and bow out for the good of the party while vowing that he may not be running for President anymore, but he will never be silenced. A sad day for America, he might say, but there are bigger things at play than himself- namely an election and the future of the American people and their children and their grand children and their great-great grand children, etc. etc. Once he’s not running for President the media won’t care anymore and it won’t matter what he said and she said. I’m guessing the inevitable book will drive up the speaking fees for awhile and that a media gig awaits him somewhere out there. As for the truth and what really happened some 14 years ago, people will have to draw their own conclusions because there are no witnesses. 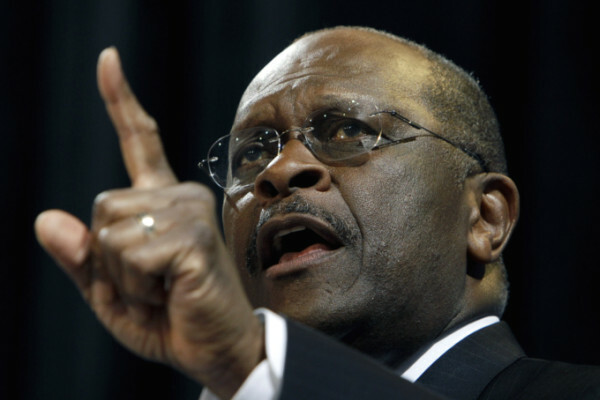 But no matter how bad it looks, no matter how many women go public, Herman Cain will not be destroyed. Just not likely he’ll be leader of the free world. Thank you so much for this excellent wrap up!